Then, I had lunch at CUCINA Urbana & thank goodness…Suddenly, flood of culinary inspiration came over me & finally, an unexpected day off amidst the craziness to spend enjoying a relaxing time in the kitchen! I wanted to make vegan versions of the soup & sandwich I enjoyed yesterday, as I had many of the components needed to recreate the meal! 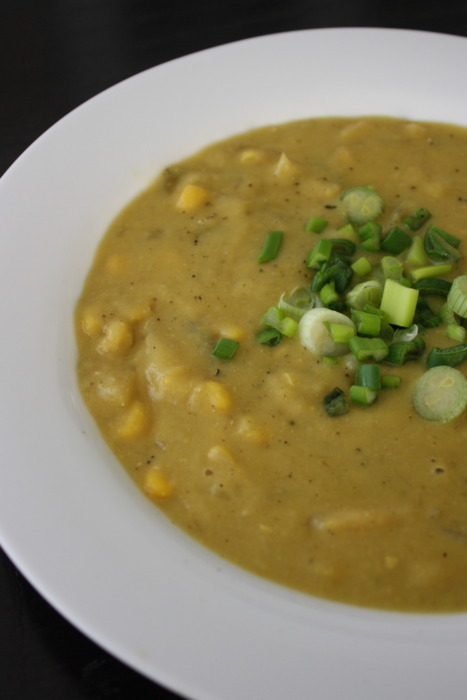 The “spring corn zuppa” was so lovely & I’d forgotten how much I love corn chowder. Even though the weather is heating up, I still sometimes crave a soup that captures the flavor & freshness of the season! I found a basic recipe on Vegan Planet & made a few adjustments with what I had on hand. This version is a little richer than yesterday’s, probably because of the addition of potato! I blended 1/2 of the soup in the Vitamix & the texture turned out perfectly! This soup is mild, yet sweet, flavorful & satisfying. In large soup pot, heat the oil over medium heat. Add the garlic, onion, carrots & celery. Cover & cook until the vegetables are softened, about 10 minutes. Add the potatoes, broth, and salt & pepper, to taste. Bring to a boil, then reduce heat to low & simmer, uncovered, until the potatoes begin to soften, about 20 minutes. Add the corn & simmer 15 minutes longer. Puree about half the soup in the pot with an immersion blender, or in a blender or food processor, & return to the pot. Stir in the soy milk & taste and adjust seasonings, if necessary. Ladle the soup into bowls, garnish, & serve.